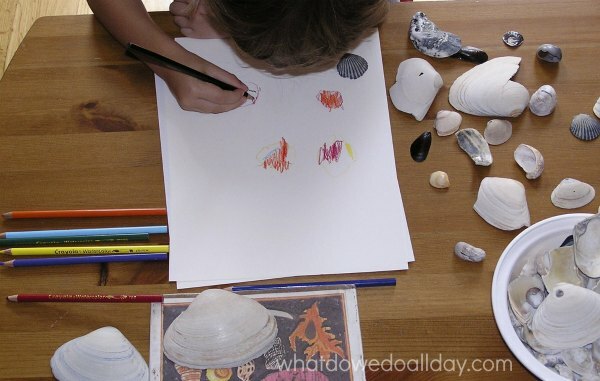 It’s beach season and we love to collect seashells. 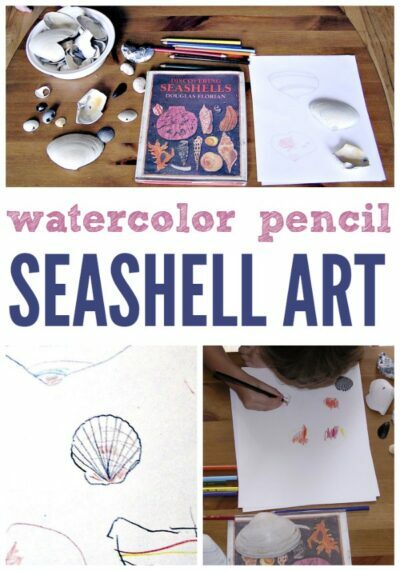 Here is a fun way to get kids drawing and painting using seashells as inspiration. It would make a great art project for a summer journal, too. We like watercolor pencils but you may choose a different medium. If you need an additional play idea for all those extra summer seashells, use them to make an ocean in a bottle. First set up the materials. I like to arrange things ahead of time. It’s more enticing for my son. It’s easier to inspire him that way. 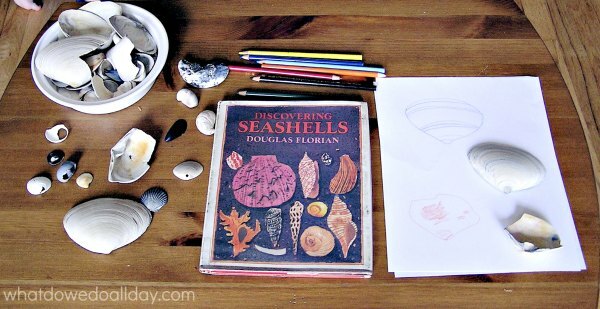 I set up paper, watercolor pencils (affiliate link) and some of our recent seashell finds, plus I included a book of seashells (see end of post for some book suggestions) I found at the library. 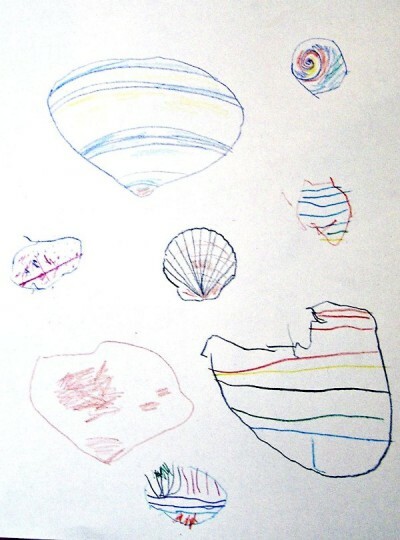 I showed Kiddo how to trace the shell. I discussed observation of the shell pattern and demonstrated replicating that pattern on the outline (you can tell which are mine in the photo above). I really love to incorporate watercolor pencils into our drawing afternoons. They are a nice change of pace and kids love to see how their drawings transform with a few brush strokes. I gave him the water and a brush after he finished drawing. I knew it would be too much a distraction, otherwise. When he applied the water with a brush he basically just made a mush of the colors (see photo below, right). Some further instructions could be useful here, or you may decide to use a different medium. It’s all about the process anyway. It certainly doesn’t bother me that his seashells look like blobs! 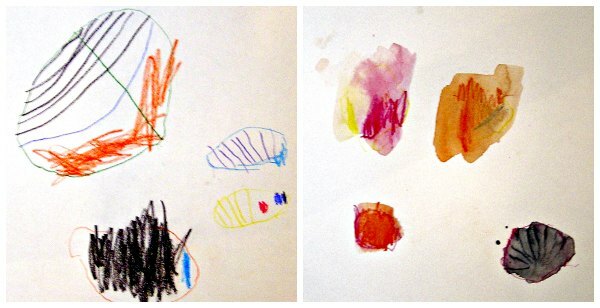 Here’s our initial drawings, he decided not to apply water to them. I think my kids would enjoy this! Pretty! The books look interesting too.